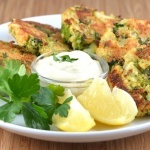 This recipe for Roasted Broccoli Cakes served with a tangy dipping sauce was a big hit in my family. With just a handful of ingredients, they are also very simple to prepare. I chose to bake these, though I suppose they could be pan-fried if you prefer. 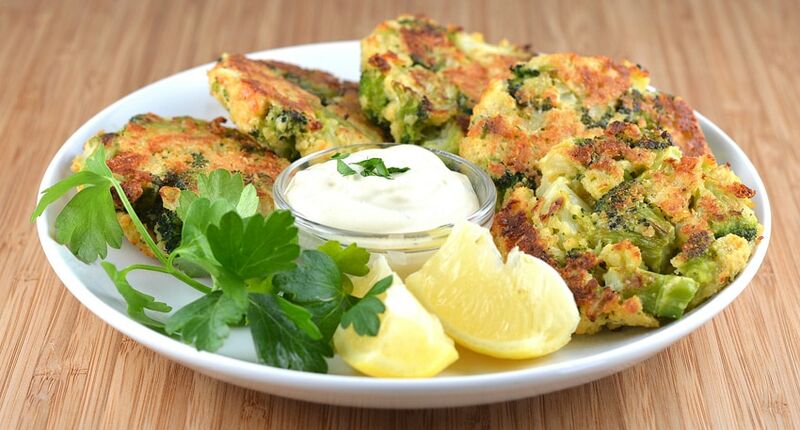 Building on my ever-growing love obsession for all things in ‘patty’ or ‘cake’ form, these Roasted Broccoli Cakes join my Crispy Cauliflower Cakes, Zucchini Corn Cakes, Leftover Irish Colcannon Cakes, Cauliflower Cakes with Sour Cream Herb Sauce and Leftover Mashed Potato Cakes. So let’s jump right in, shall we? The first step is to defrost a 12 oz. bag of frozen broccoli. I don’t know why, it just seems to work better. Moisture content perhaps. I microwave it until it’s just warm and the liquids start to drain. I place it into a colander and press firmly with paper towels to get out as much water as possible. Roughly chop the broccoli into bite-sized pieces. In a medium saute pan, add a teaspoon or two of oil and the diced onions. Cook until they begin to turn translucent and get tender. At this point, you could add some minced garlic. Not a huge fan personally. Allow to cool. Meanwhile, add the chopped broccoli, breadcrumbs, flax mixture, vegan cheddar shreds, vegan parmesan, salt and pepper to a large bowl. Once cooled, add the onions. Stir well to combine. Using a large cookie scoop (or measuring cup to assure uniformity), place the measured amount into the palm of your hand. It helps to slightly moisten your hands with water to keep it from sticking. Form into a tight ball and then flatten into patties. Place on a lightly oiled baking sheet. Bake at 400 degrees for about 10-12 minutes and then flip so both sides get golden. It’s important not to overcook these or they will become dry. While the patties are baking, combine all of the ingredients for the dipping sauce. 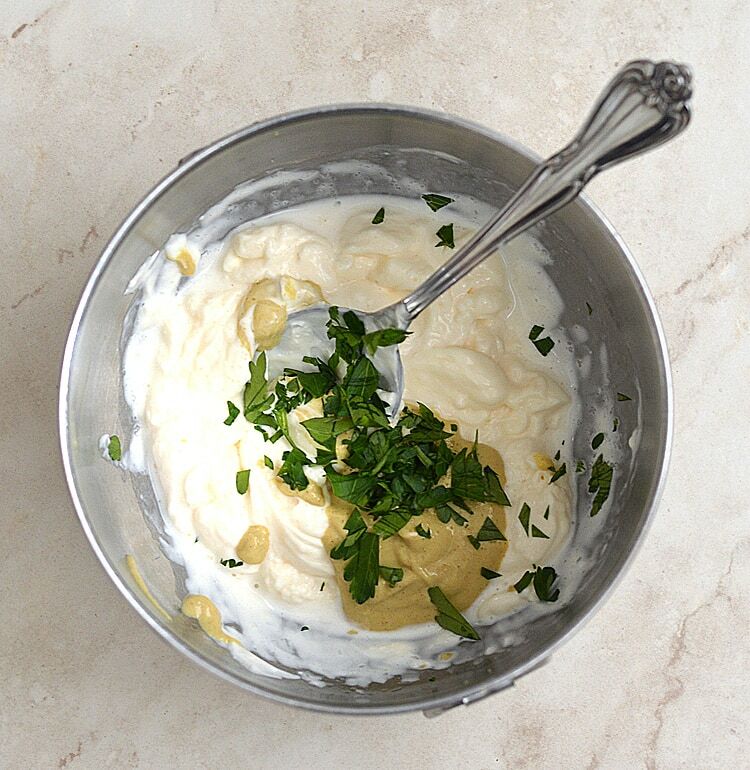 I used vegan Mayo, Dijon Mustard, Lemon Juice, Salt, Pepper, and Chopped Parsley. Stir to combine and set aside. 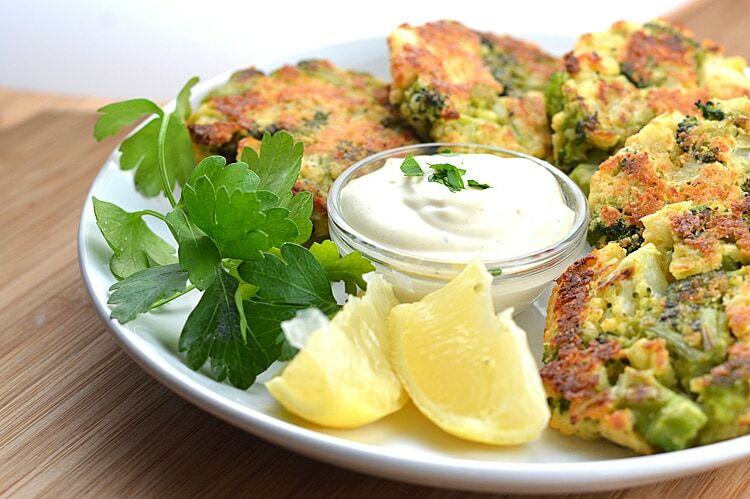 Serve the Roasted Broccoli Cakes with the tangy sauce and garnish with a sprig of fresh parsley and wedges of lemon. I promise you are going to love this one as much as I did! Preheat your oven to 375-400 degrees. 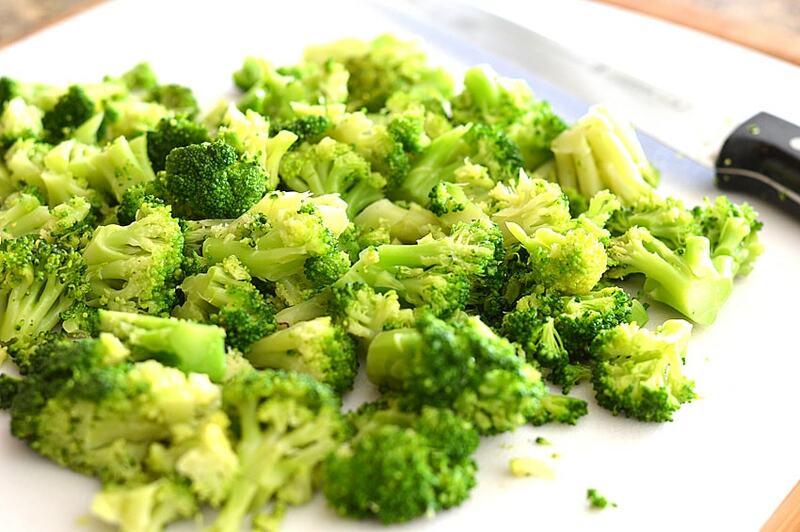 Defrost the broccoli, strain any liquids and press with paper towels to remove as much water as you can. Coarsely chop the broccoli and set aside. In a medium saute pan, add oil and onions. Cook until translucent and tender. Cool completely. 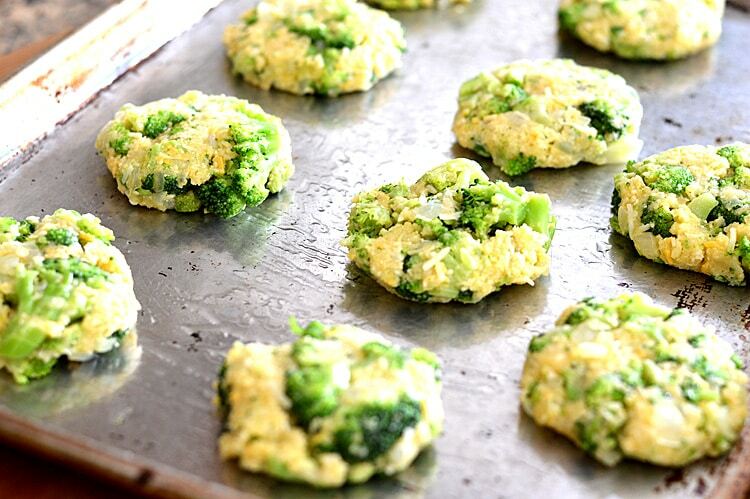 Meanwhile, combine the remaining ingredients for the Broccoli Cakes and add the onions and broccoli, stirring well to combine. Using a large ice cream scoop, cookie scoop or measuring cup, add measured amount to the palm of your hands. Moistening your hands helps to prevent sticking. Form into a tight ball and then flatter into patties. Transfer to a lightly oiled baking sheet (do not use parchment or a Silpat for this recipe). Roast for about 10-12 minutes or until showing signs of becoming golden. Flip and cook for another 5-10 minutes. While the patties are roasting, combine all of the ingredients for the dipping sauce. Serve with a garnish of fresh parsley and wedges of lemon.